There had been a six-month gap between this fight and my previous one, so I wasn’t quite sure what to expect, but to say that I was eager to get back in the ring would be a huge understatement. I needed it. During that break, Master Toddy had made some changes to my training, as had I, so I was looking forward to seeing how it would all come together. Thankfully, I wasn’t the only one from the gym who was fighting. There was also another guy, Martin, and two of my trainers, Kru Singh and Kru Ar-Thit, who would be fighting on the same card. It’s much nicer to fight as a team, and also takes a little of the pressure off! The fight took place in Hua Hin, which is somewhere I’d never fought before. I’d been told that it would take around three hours to drive there from the gym, but that was slightly optimistic. In fact, we left at around 5pm and arrived just before 9pm, just as the first fight started. I had assumed that we’d be fighting in a stadium, but it turned out to be at a gym called Cong Carter Muay Thai. It seemed to be in the middle of nowhere, but looked like a really good set up. 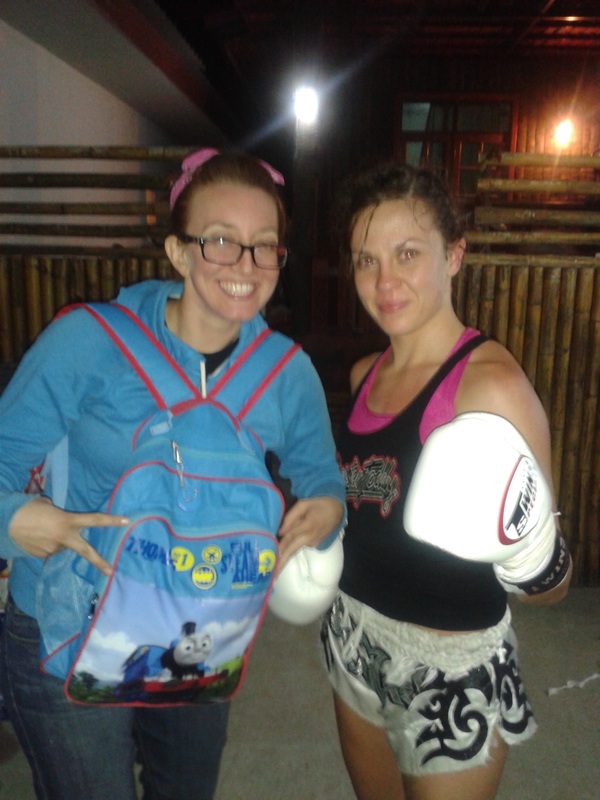 Just as I got out of the van, I received a text from Lindsey Newhall, who writes a column for Fightland on her experience of training at Kiatphontip in Bangkok. She had come to the very same venue with a fighter from her gym and seen my name on the list, which was a happy coincidence. She originally got in touch with me online and we met once for dinner, but hadn’t managed to link up again since then, so this killed two birds with one stone. I headed straight for the women’s bathroom where a Thai girl immediately locked eyes with me, looked me up and down and smiled. I assumed that she was my opponent, and shortly after that, saw her and her friend talking and pointing at me, not so discreetly, which pretty much confirmed my assumption. I was relieved to find that I was the ninth fight, so I had some time to relax a little before I had to get myself ready. As a female, I’m used to getting my fights out of the way relatively early and being able to watch the rest, so I was surprised when my everyone started rushing to get Martin and Kru Singh ready. It seemed odd for Martin to fight first, since he weighs about 90kgs, but I just went with it. However, another thing I am used to is usually being somewhat the centre of attention regarding fight prep, so I started to feel a little uncomfortable when I realised that the fact that so many of us were fighting meant that it would all be very last-minute. Our fights were so close together that we had almost no time to prepare in between, and when I was told that I was up in two fights time but was still without hand wraps, I definitely felt on-edge. However, I’d had to fight without a warm-up during a similar experience in my third fight, so I trusted that it would all come together. Kru Singh had fought immediately before me, and Kru Ar-Thit was fighting immediately after, so neither of them were able to accompany me to the ring for my own fight. Instead, my training partners cornered for me. This wasn’t a problem, because I knew that there was no use in stressing about it. I had to go into the ring with a clear mind and remain focused on implementing everything that I’d been working on. My opponent, Nong Ning, fought much like I expected her to, throwing a lot of front kicks at me to keep me out. You’d think that would mean I defended them, but I didn’t. Most of the time, I just took them, which wasn’t smart. They affected me mentally more than physically, as they were just frustrating and annoying to deal with. Since I’d had no warm-up, the first round was essentially my warm-up in itself. She put me down twice; once with a well-timed front kick and once in the clinch. Then, the bell rang. As soon as I started to put some power in during the second round, the fight started to go my way. I landed a couple of knees, after which she slowed down, and when I caught her with a right hand shortly after, I noticed her face change, so I threw another one, followed it with a right body kick, and watched her go down. I expected her to get back up, but she didn’t, so the referee called it and I won by KO. It surprised me at the time, because it didn’t seem like a particularly powerful kick at all, but it must have just caught her in the right place. I later found out that the odds were 3-1 against me, as Nong Ning is apparently quite well-known around Hua Hin. The night was a success for all of us, as we all ended up winning our fights. Martin won by KO in the first round, and both of my trainers won their fights by decision. The last kick of the fight. I definitely experienced some ‘ring rust’ in this fight, and there were certain things that I was really annoyed with myself for. In fact, during and after the fight, I felt like I’d performed terribly. However, on reflection, while there were things I could have done better, there were also other things that came through well for me. Plus, I can’t complain about a KO win. After 6 months without a fight and even longer without a win, this was exactly what I needed to dust off the cobwebs and boost my confidence. It had also come at perfect timing, just a few days before Christmas. Immediately after the fight, the promoter asked me if I wanted to fight again five days later. I thought about it for a moment, before realising that he meant Christmas Day and quickly declining. This will be my fourth Christmas in a row away from home, and I’ve planned to finally have a real Christmas dinner, so there’s absolutely nothing that could tear me away from that. I have another fight scheduled for the 15th of January, so I’m not in a rush to have one before then. Still, it really does feel great to be back in the game. The best thing about it is that now I have a very clear idea of the areas that I need to work on. There are little mistakes that Master Toddy has been pointing out to me constantly in sparring, and although I was aware of them, nothing makes them clearer than seeing myself doing them in a fight and thinking “oh yeah, I really do do that”. I can really see how those things affected the fight, so I’m excited to get started on those. The prospect of being able to use these small revelations to make myself better is an exciting one. Fighting at Cong Carter Muay Thai was a really great experience. It’s a relatively new gym, owned by a Danish guy called Nick, who was super nice. In fact, everyone there was really friendly, and although it seemed to be rather out of the way, there was a big audience with a lot of foreigners there, which was a surprise. When you fight in Thailand, you become used to pretty minimal conditions, so I was really surprised to see how well-put-together everything was there. The fight schedule was true to the program that I was handed on my way in (you’d be surprised how often that isn’t the case), both the ring and the gloves were nice and new, and the showers were practically luxurious in comparison to the places I usually fight. In fact, after coming out of the shower, I was telling everyone who would listen how much I enjoyed it. There were towels, shampoo, tissues and warm water; these things are like gold dust to me after a fight. All in all, I really enjoyed fighting there and I’d be happy to make the trip out there again. What I didn’t enjoy so much was the next morning. The long drive home meant that we didn’t arrive until just before 6am, and I was due at work at 11am. Thankfully, I had no injuries, so the experience wasn’t as unpleasant as it could have been. Also, I’m used to having to teach the day after a fight, as I’m always back at work on the following day. A few days later, I’m back in training in preparation for the next fight, but I shall certainly be taking some time out to have a large amount of celebratory Christmas food before then. That was so crazy to run into you there, and thanks for letting me borrow your jacket while you fought. I really liked your white shorts. They looked great up in the ring! I love that the odds were 3-1 against you. Somehow that makes the win all the more glorious. Hope your Christmas and New Year were fun and festive, and that we run into each other again at some fights in 2014. It was a nice coincidence! It was nice to see you, sorry I didn’t get to say goodbye, though! I’ll definitely let you know next time I’m fighting in Bangkok. I hope you had a great Christmas and New Year, too! Congratulations! It sounds like a great victory, specially after a layoff. Will you be posting a video? The number of videos now on YouTube etc must have been really helpful for people getting into the sport. Thanks! I haven’t uploaded any videos just yet because I was keeping it just about the writing, but I may upload some soon. That’s excellent. When I was boxing you had to rely on your instructor and occasional show. Now there are 1000s of videos to learn from. The more the merrier. your needs? I wouldn’t mind creating a post or elaborating on a number of the subjects you write in relation to here.